Welcome to All4JMJ!! A site dedicated to the Holy Family.. Growing up in Catholic schools, I was taught to place the initials J.M.J. in the top right corner of all my work. This served as a constant reminder to sacrifice my efforts to the Holy Family; Jesus, Mary, & Joseph. I remember striving to offer only my best efforts in their honor. As an adult, I believe that it is even more worthwhile to do the same. 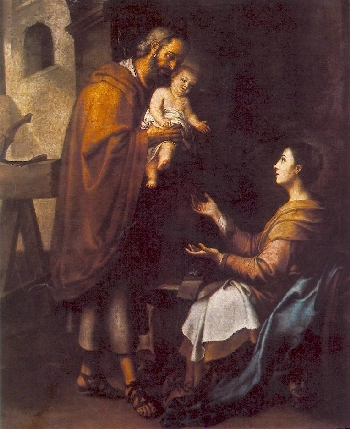 The Holy Family exemplifies the ideal for all families. While living thousands of years before these "modern" times, Joseph and Mary struggled with many of the same difficulties as we do today. Can you imagine the fears Mary must have experienced? First, an angel appears; informing her that she is entrusted with the awesome responsibility of carrying God's Son.. She then has to convince her mother and her fiance that she is telling the truth.. Her marriage did not exactly start off easily.. having to travel, Very Pregnant miles from her home; her family; her friends. I am sure that she was frightened about the fast approaching time of labor. No high tech hospitals there! Meanwhile, what about Joseph?? His fiance springs news of a pregnancy.. One that he Knows is not his.. He too receives an angelic visitation.. He wants to protect the woman he loves, yet .. if what she claims is true.. HE is to be the earthly father of the coming Messiah!! He is but a poor carpenter.. He wants to provide for his family, yet when the time comes for the birth of GOD'S Son.. he cannot even find a room.. His family is then pursued by Satan's accomplices.. They have to flee to safety in a foreign land. As parents, they had incredible responsibilities.. to "teach" Their Savior.. They worried about family, about finances; of health; of love.. They went through experiencing the joys and pains of life.. the life which God had planned.. The difference, however, was through their complete acceptance of His will in their lives.. in that "Yes, Lord!!" they uttered so willingly.. the "Yes" echoing still today.. providing a path to Salvation. Even our Lord, Jesus Christ, had His time of human trial.. He also went through periods when He may have preferred for God to take His Cross... but prefaced His request only if it was God's will.. It is my hope that each of us may gain the peace needed to also do His bidding. To accept our individual crosses and in times when they seem to be too heavy, to turn to the examples set before us.. and to always remember we are Never alone!! May this site help you in your individual journey!! God bless and may the Holy Spirit fill your heart with His Peace!! Our Father, Hail Mary and Glory be three times. Amen. Wish to Share a Little Inspiration? Sometimes we allow the world's worries to overwhelm.. A helpful reminder! For when we question "Why??" Miracles happen each and every day.. if only you believe!! Hungered?? Thirsty?? Look for the True Bread of Life!! Experiencing the loss of a loved one is never easy.. no matter when.. or what the circumstances.. but there is Hope!! A Light in the darkness! !